Rush System for Health is a not-for-profit academic medical center comprising RUMC (which we also refer to as Rush in this report), Rush University, Rush Oak Park Hospital, and Rush Health. Rush encompasses a 664-bed hospital, serving adults and children, including the Johnston R. Bowman Health Center. The Bowman Center provides acute inpatient and day rehabilitation services for older adults and people with short-term and long-term disabilities,and has apartments for moderate to low-income seniors. The mission of Rush is to provide the very best care to patients. Their education and research endeavors, community service programs and relationships with other hospitals are dedicated to enhancing excellence in patient care for the diverse communities of the Chicago area now and in the future. The vision is for Rush to be recognized as the medical center of choice in the Chicago area and among the very best in the United States. Rush was named one of the nation's top 50 hospitals in 11 out of 16 specialty areas, including geriatrics in 2012-13 U.S. News & World Report. Rush has a Department of Health and Aging under the direction of Robyn Golden, LCSW. Robyn has an extensive background in health care including acute care, LTPAC, and HCBS. In addition to her health care background, Robyn also has an in-depth understanding of policy issues from her Fellowship on Capitol Hill working for Senator Hillary Clinton and collaborating with agencies such as the Centers for Medicare that Medicaid Services (CMS) and the Office of the Assistant Secretary for Planning and Evaluation. She and her team strive to evolve practice by creating and testing new models of care by merging practice, research, policy and education. Social work services focusing on wellness through assessment and connections to resources. Transitional care for moving from the hospital to home and coordination of services for at-risk seniors. Resource centers with information on program, services and supports (Anne Byron Waud Resource Center for Health and Aging at the Johnston R. Bowman Resource Center and the Tower Resource Center at the Tower Hospital Building). Rush Generations (a membership program for individuals and caregivers who are concerned about aging well that provides tools and resources on healthy aging). Developing and testing new models of care and health care innovations. Within the Department of Health and Aging is the Transitional Care Team under the management of Madeleine Rooney, MSW, LCSW. The transitions team is comprised of social workers who provide direct services to support the discharge planning process and coordinate services with community caregivers and programs. 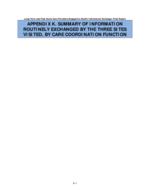 The Enhanced Discharge Planning Program (EDPP) was designed by the Rush transitional care team to aid in patients' transitions from the hospital to their home (beyond the typical hospital discharge planning process). The transition services are coordinated by social workers who provide telephone followup and short-term (30 day) care coordination for recently discharged adults. The social workers conduct a bio-psychosocial assessment that includes a review of medical records, discharge plans and participation in pre-discharge interdisciplinary rounds. The social workers interact, typically by telephone and some e-mail, with patients and caregivers after discharge to identify gaps in care and help address identified needs. The social workers are a resource for patients and caregivers. A randomized control trial showed a decreased in hospital readmission rate at 30, 60, 90, and 120 days post-discharge. Participants were more likely to make and keep followupappointments, had a better understanding of medication management, experienced reduced caregiver burden and had lower mortality rates as a result of the EDPP interventions. Improved access to information to support community-based organization (CBO) programs including better longitudinal data on the patient's history, past service utilization and access to relevant medical record information (such as the name of the primary care physician, followup appointments, demographic data, diagnoses, medications, and cognitive and physical function assessments). The need for improved funding models that supported transitions and coordination with community organizations. The need for improved relationships and recognition by hospitals of community providers and organizations to support the transition and care coordination process. Over time the ITCC developed, tested, and refined concepts to address their mutual challenges. One of those concepts is known as the Bridge Model and was the foundation for a CMS Community-Based Care Transitions Grant (both described below). The Bridge Model concept was inspired by the Rush EDPP and then developed by the merging of best practices identified by the ITCC members. Aging Care Connections.3 Aging Care Connections is a private, not-for-profit organization dedicated to serving older adults and their families through community-based services that promote dignity, self-respect and independence. Aging Care Connections is the suburban Chicago Area Agency on Aging (AAA) and Aging and Disability Resource Center (ADRC) and is the central administrator for ITCC. Services provided by Aging Care Connections include: information and assistance about resources, care coordination, education and training, chore keeping, transportation, home-delivered meals, respite, support groups and more. Shawnee Alliance for Seniors.4 Shawnee Alliance for Older Adults programs serve persons over the age of 60 and their caregivers. Programs provide access to services that enable older adults to maximize their independence and remain in the community, advocating for the rights of older adults and their quality of life in the community and in nursing homes, and protecting older adults from abuse, neglect, and exploitation. They have developed and administer preventive primary health and social services and also provide services such as case management and counseling. Solutions for Care.5 Solutions for Care serves the adult community and the people who for care for them. They work to find the resources that preserve independence and dignity, that lead to greater self-sufficiency and a higher quality of life. They work with individuals to access the resources available to manage their care. Health and Medicine Policy Research Group.6 The Health and Medicine Research Group is an independent, not-for-profit research and advocacy institute with a focus on Illinois public health and care for the poor and under-served. University of Illinois at Chicago (UIC), School of Public Health.7 The UIC School of Public Health works in partnership with community and governmental organizations to improve the health of the public and provide a learning experience for students and advance innovative research. RHA offers innovative programs and services designed to measurably improve health and quality of life through its program, services, and innovative research. The RHA focuses on adults and caregivers as discussed earlier in this report. Other Chicago Area Hospitals include Adventist LaGrange Memorial Hospital, Memorial Hospital of Carbondale, Herrin Hospital, and MacNeal Hospital. 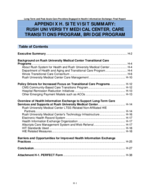 The ITCC developed the Bridge Model to improve care coordination. It was originally developed with a focus on older adults, but is merging as a program for adults of all agencies with chronic conditions. Inspired by the EDPP noted earlier in the report, the Bridge Model9 is a social work based approach to transitional care that builds off of the aging network, designed to help older adults with chronic conditions discharged from an inpatient hospital stay to safely transition back to the community through intensive care coordination that starts in the hospital and continues after discharge to the community. The Bridge Transitional Care Program is a hospital and community partnership. There is physical office space at Rush for the Bridge Care Coordinators (BCCs) to receive referrals and access hospital and community records. The BCCs have expertise in geriatrics, strong clinical and advocacy skills, experience working in both community and hospital settings, and knowledge of state, federal and community resources. At Rush, the BCCs are their employees, but at other area hospital sites the Aging Care Connections and Shawnee Alliance for Seniors employ the care coordinators. The Bridge Model was built and refined based on the experiences of the Consortium members and the challenges their patients' faced at care transition when they transitioned across various health care providers, payers and service delivery models. The ultimate goal was to coordinate existing systems (Figure H-1) to better serve older adults and their caregivers. The Bridge Model assesses transition/discharge plans and issues related to home health, medical care, medication management, self-management and psychosocial complications using a proprietary accountability and communication tool called PERFECT (see Attachment H-1) to improve transitions to home care. The PERFECT form defines the mutually agreed upon expectations for care, documents the services identified and communicates problems and resolutions. A pilot project was conducted by the ITCC and anecdotal results found that PERFECT helps to identify risk elements for readmissions. Pre-Discharge. BCCs within the hospital identify older adult patients who may be at risk for post-discharge complications. Referrals can originate with hospital discharge planners or be generated through an integrated risk screen in the Epic EHR. The BCCs meet with older adults and/or their caregivers in the hospital room or in the ARC to identify unmet needs and to set up services prior to discharge. BCCs may also prepare individuals for discharge by reviewing medical records or meeting with an interdisciplinary team within the hospital. Post-Discharge. Often new needs are frequently identified soon after an older adult returns home. BCCs call consumers within 24-48 hours after discharge to conduct a secondary assessment and intervene on identified needs. Areas of need include understanding discharge instructions, transportation issues, physician followup, burdened caregivers, problems with home health care, difficulty obtaining and/or understanding medications and others. 30-Day Followup. The BCCs followup with patients at 30 days post-discharge to track their progress and address emerging needs and to ensure that people are connected to longer-term support services. Evidence has shown a positive impact on readmissions, physician followup, understanding of discharge plans, understanding of prescribed medications, access and timeliness of community services, and mortality. Bridge community partners reported improvements in receiving more complete information at the point of transfer and understanding patient more completely before services are started. Rush has case management services lead by Sandy McFolling, Hospital System, Director of Case Management. The director also oversees the utilization review and clinical documentation improvement functions as well as social workers who work in transplant and chemotherapy. The case management strategy is to develop partnerships in the community and build collaboration with the hospital. The focus of LTSS programs at Rush relates to improving care transitions through a patient-centered approach that engages a multidisciplinary health care team to identify and address barriers in collaboration with community providers. Their multidisciplinary team includes: nursing, physicians, nurse and social work case managers, pharmacists and Bridge social workers. Facility Transitions in Care (July 2008 - Current). 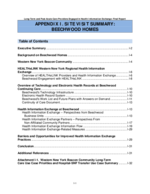 The case management department makes a followup phone call within 24 hours to the receiving SNF to determine if pertinent information was received and correct, the patient presented as expected, and the patient/family was satisfied with the plan. The goal is to resolve issues immediately and establish a basis for collaborative problem solving and process improvement between case management, nurses, physicians and facilities. Since the program started, Rush reported readmissions to the hospital within 30 days of discharge decreased from 43.9% in 2007 to 11.9% in 2012. Skilled Facility Rush Coordinated Care -- Rush Physicians and Nurse Practitioners (2012 - Current). A program at four SNFs is aimed to improve coordination of care through engagement of Rush nurse practitioners and physicians. With this program, the patient is seen by the physician or nurse practitioner post-hospital discharge at least twice in the first week and then weekly until they are stable. The nurse practitioner works closely with the nursing home staff through face-to-face discussions, bedside teaching and ongoing availability by cell phone. Quarterly meetings are held with the Rush Coordinated Care Director, each skilled facility owner/administrator, and Case Management Director. Monthly data is tracked to identify areas of success and need for improvement. Decrease frequency of Bridge social work followup calls related to issues. The HHAs that are part of the CMS Community-Based Care Transitions Program (CCTP) also participate in a pilot project where the care team holds a weekly care conference to monitor the patient's clinical and social status to identify issues and implement timely interventions to prevent readmissions and/or address chronic problems such as poorly controlled pain. The goal is to operationalize the best practices that emerge from the CCTP grant at Rush and with community partners. Inpatient Collaborative Care Model (August 2010 - Current). This pilot project developed and tested a standardized set of interdisciplinary care coordination protocols on one medical unit to promote patient satisfaction, reduce readmissions and decrease fragmented care. The program utilized concepts from the Bridge Program and Project Better Outcomes for Older Adults through Safe Transitions (BOOST). Readmission Reduction Project RED Pilots (October 2012). The goal of this project was to maintain an overall readmission rate of less than 12.32% at Rush. Under this project, Rush is developing and implementing processes and maintenance metrics to achieve a reduction of 20% in the overall readmission rate. At the time of the site visit, Rush completed initial meetings, identified a bundle of 12 reinforcing interventions, and started a pilot. Next they will implement daily risk reports and use a new discharge advocate flow sheet in Epic to analyze results. The Bridge Program. Described above. The success of Rush's care transition and community engagement programs is dependent on having the right people, processes and information available. 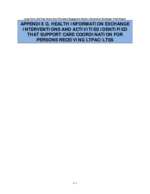 The section titled "Health Information Exchange Information Flow" will describe the information needed at key points of transition and shared care. These programs have been recognized for their innovation and success having won awards from the Case Management Society of America and URAC (an organization that promotes health care quality through accreditation, education and measurement programs). 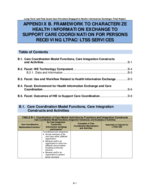 Illinois Transition of Care Consortium, Bridge Model. http://www.transitionalcare.org/the-bridge-model. The availability, use and exchange of information are crucial to providing LTSS. As noted in the programs above, Rush has been dedicated to improving the transition of care process for a number of years. To accomplish this goal they have engage various departments/staff within the hospital system, affiliated providers such as physician practices owned by Rush, and non-affiliated providers. This section describes the non-affiliated providers that were interviewed during the site visit, describes the technical infrastructure at Rush including the availability of a community HIEO, and describes the health information exchanged at transition of care and during shared care using a framework designed under this project. During the site visit, three community (non-affiliated) partner organizations were interviewed to discuss the types of HIE/sharing that occurs as well as the challenges and opportunities. They are not the only LTSS community partners, but selected for study purposes. Health Resource Solutions (HRS) Home Care.12 HRS, a Medicare-certified HHA, serves the Chicago area (an 11 county region) providing nursing and therapy services including: 24-hour telemonitoring, geriatric care, psychiatric care, neonatal care, pediatric care, pediatric infusions, IV therapy, high tech infusions, physical therapy, occupational therapy, social work, and disease statement management. 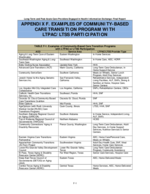 Specific to this project and LTSS, HRS is the preferred home care provider for the 3026 Grant (CMS CCTP) and Rush HHA Transitions in Care Program. They actively participate in pre-discharge planning at the hospital with the interdisciplinary team for high-risk Medicare beneficiaries. Under the Bridge Program they utilize the PERFECT tool to improve the success of transitions. In addition, HRS has found that their use of telemonitoring for select cardiology conditions has reduced hospital readmissions resulting in preferred provider status for RUMC and other Chicago-area hospital cardiologists. An HRS staff member is at the hospital receiving referrals, assessing the patient, and interacting with hospital case management staff. HRS uses Allscripts EHR for home care and receives their referral information through the AllscriptsCare Management tool for sharing relevant information at the point of transfer from the hospital to home with home care services (such as demographics, financials, referral, medication information, equipment needed and clinical information related to care needs). Some of the information in the Allscripts Care Management tool can be integrated into the HRS EHR such as demographics. Other information is printed and scanned into theAllscripts EHR. Warren Barr Pavilion.13 Warren Barr is a SNF that has partnered with Rush in their Skilled Facility Rush Coordinated Care Program. They provide sub-acute rehabilitation services, orthopedic rehabilitation, a specialized chronic heart failure transitional cardiac care program, advanced wound care, IV therapy, and other specialized skilled nursing service. At the time of the site visit Warren Barr was just in the process of implementing an EHR system -- Point Click Care (PCC). They used Allscripts Care management for referrals from Rush which also provided relevant information (history and physical [H&P], labs, therapy, progress notes, social work notes, durable medical equipment [DME], demographics and financial data). Because information in Allscripts Care management is not interoperable and PCC does not support interoperable information exchange, information from Allscripts Care management cannot be automatically incorporated into the PCC system -- it must be re-entered if it is to be incorporated into Warren Barr's EHR. Warren Barr utilizes the Interact tools including the Situation, Background, Assessment and Recommendation Report (on paper now, but electronic once PCC implemented). When Warren Barr sends patients to the hospital (typically through the emergency department) they send by hard-copy a packet of information (demographics, diagnosis, medication list, labs, H&P, etc.). Warren Barr does not create an electronic, interoperable transfer form to support the transition. They have found that information often does not make it to the medical unit where the patient eventually stays. Another challenge is finding the patient in the hospital and ensuring that the staff are aware that they are a Warren Barr patient. A Rush physician and nurse practitioner sees patients at the SNF and will document in the SNF's EHR. For Rush patients these clinicians will also have to document in the Rush EHR system. The physician can access the Rush EHR to obtain any information needed for shared care. Aging Care Connections is funded in part by federal and state government agencies, the local AAA, local municipalities and townships as well as private funding like the United Way. They maintain an electronic client management information system (CMIS) and paper-based client records to records (but not an EHR). The information system maintains client records such as demographic records, results of screenings/qualifications for services, limited medical information such as medications and assessments, and service utilization records. The CMIS is not integrated with other community partner information systems/EHRs. In their role to investigate Elder Abuse, they must maintain a specific computer to access the state database to upload reports. When Bridge social workers and/or case managers identify the need for the HCBS listed above, they share via phone, fax and e-mail demographic information, and other initiation of service information. The social workers spend significant time moving information manually, following up by phone or e-mail to make sure information was received, and following up to make sure services were implemented. Aging Care Connection has data sharing agreements to access medical record information at some area hospitals to support the transition planning process. Where agreements are in place, staff at the Aging Care Connection may access the hospital EHR to review relevant information such as the discharge plans, diagnosis, medications and assessments. To understand the technology infrastructure and future plans, Dr. Julio Silva was interviewed during the site visit. In addition to Dr. Julio Silva being a vice president and the CMIO at Rush, he is also the Medical Director for MetroChicago HIEO which is under development. Rush University Medical System has a tag line for the EHR -- "one patient-one record." Both the hospital and ambulatory care practices use Epic EHR system for all patient care documentation in the hospital and ambulatory care sites. There are approximately 1,000 physicians in the Rush system -- 6% are employed by Rush and 40% are affiliates. Rush also extends Epic on a fee-for-services basis to some non-Rush physicians and manages the IT infrastructure for a management fee. Epic supports the Care Transition Program by providing the ability to route information to staff or affiliated provider (e.g., results delivery, routing to an in-box). Rush utilizes Epic's HIE platform Care Anywhere. 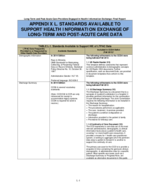 Care Anywhereis only available to Epic EHR system users, however, and the use of Epic is limited in the LTSS community. The Patient Care Managers at Rush use a different application document their narrative care management notes. At this time there is not an interface between the care managers' application and the Epic EHR. Rush is working on an electronic Bridge template in the EHR system. 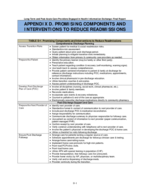 This template would enable the electronic incorporation of the BCCs documentation including their assessment of post-discharge risk elements in the Epic EHR and viewable by all authorized users of the system. The State of Illinois is developing a federated HIE model with a record locator services that will reach out to regions and bundle and route information. One of the regions in Illinois is the Chicago area. There is currently not an operational HIEO in the Chicago area; however, there has been a big push to support HIE in the region since many different EHR systems are deployed -- none of which talk to one another. As a result, a MetroChicago HIEO is under development with Dr. Silva serving as the Medical Director. A Metropolitan Council comprised of 120 hospitals and communities are working together to establish the HIE. The Council began with addressing governance. In April 2013, they selected a HIE vendor. Dr. Silva indicated during the interview that the MetroChicagoHIE platform will support care coordination efforts. The HIE will have functionality to support Direct messaging, event notification for primary care providers, results routing, referral management, and eventually population management, analytics and case management. To communicate with LTSS providers, LTPAC providers and some community partners, Rush uses the Allscripts Care Management application for communication/referrals with community partners. The secure communication includes non-structured messages and attachments for information such as demographics, financials, services recommended, medication information, equipment needed and limited clinical information related to care needs. Subscribers have full access to information exchanged while non-subscribers could access some minimal limited amount of information. For providers who have the AllscriptsEHR program, some information such as demographics can be integrated/populatedinto the EHR application. Otherwise information must be printed and scanned or re-entered into the EHR application. Users of the AllscriptsCare Management application find that it has significantly helped with the timely transfer of information to support transition of care. However, communication is not bi-directional. Information is sent only one way from the hospital. Some of the challenges of the system include the limited content exchanged and the cost for community partners to subscribe. About 80% of patients are not in the Rush network of providers (or preferred partners) who use Epic and/or AllscriptsCare Management, resulting in the majority of communication around transitions occurring by phone, faxing and e-mail. Table H-1 describes the information exchange activities for Rush and their LTSS services as they coordinate transition planning services. The exchange scenarios are not limited to electronic exchange. It was not possible to determine the level or type of health information technology (HIT) standards used to facilitate exchange. Epic is a certified EHR application and therefore meets the applicable standards required for Stage 1. 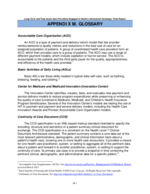 Allscripts Care Management does not appear to use interoperability standards (such as a continuity of care document or clinical document architecture) since content and attachments could not be incorporated. However, it appears that Health Level 7 v2 messaging standards for demographics are used to move data from Allscripts Care Management into Allscripts EHR. Referral for Community Services Patient is assessed for risk factors, discharge plans are being evaluated. A referral for LTSS evaluation is made. Case managers make referral to appropriate HHA provider. Case managers make referral to appropriate facility provider (e.g., SNF). BCCs social worker assesses patient to determine services needed. Makes referral to community service provider if need is determined and/or followup to ensure services in place--pharmacy, DME, counseling, etc. 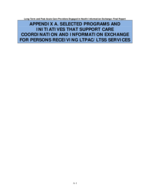 Transfer/Admission to LTPAC/LTSS Obtain physician order or communication for discharge, services, and/or followup. Prior to discharge, a pharmacy student reviews the discharge instructions sheet & completes a pre-discharge medication reconciliation. Discharge from LTPAC to Another Provider Patient transferred from facility back to hospital. LTSS Care Coordinator followup with Community Service Provider & Patient Case Management makes followup contact within 24-48 hours on all home health & SNF transfers to assist in assuring services started, answer questions, etc. Patient Care Coordinators and/or BCCs followup with referrals made for community services. Verifies that services were delivered; follows up on issues. Admission Physician Visits/Evaluation (NH) Rush physician & NP visit SNF patient 2 times during first week after admission & weekly until stable. Care Management/ CCT Meetings Weekly case management meetings between Rush & HHA Provider. Quarterly meeting between Rush & Facility Provider (part of SNF Rush Coordinated Care Program). Ongoing physician visits/ evaluation (NH) Rush MDs & NPs visit SNF patient for regular scheduled visits & as needed to meet medical needs of patient. MD remote electronic access to view Rush EHR as needed. Aging Care Connections Coordinator to State Agency. 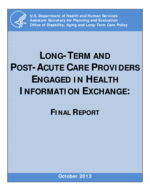 Over the course of the two-day site visit, a number of issues were identified related to information exchange in support of care transitions and engagement of LTSS programs. Rush staff and community partners interviewed offered observations on both barriers and opportunities to improvement in improved HIE, communication and coordination practices. The lack of a referral application (that is affordable to all) to share information between the hospital and next care providers is a significant issue since 80% of Rush's discharges do not go to a provider within the system (or a preferred provider). Allscripts Care Management has been very helpful, but its use is limited to certain providers (i.e., those who have chosen to invest/acquire this software). AllscriptsCare Management is also limited because it does not allow bi-directional communication. Clinicians report a need for an electronic system that would allow routing of transition in care/shared care information to additional non-affiliated provider types. The Chicago-area HIE has not considered how to engage community partners such as home and community service providers in the HIE. They are planning for supporting transition of care processes with providers such as HHAs and nursing facilities, but had not identified community service providers as target for the HIEO. Home and community service providers find it a barrier that they cannot electronically access information from other providers EHRs, medical records, or client service records for implementation of services, assessment and care planning activities. Information (such as a mini-mental exam) completed by the various providers, if electronic and available on an HIE, would provide valuable information and reduce duplication. An HIEO could provide the foundation for a longitudinal (community) care plan that would be invaluable for communicating patient goals and coordinating services across multiple care providers. Providers would have important information available reducing the need to "start from scratch" with each encounter, streamlining communication and aligning services. The traditional view of case management from a hospital discharge perspective needs to change to achieve a patient-centered approach to coordination and collaboration that extends beyond discharge, engages community partners and helps to support the patient in meeting their health care goals. Rush representatives expressed a concern that current payment models did not cover care coordination/case management roles needed by some patients and include the provision of LTSS programs and HCBS. They saw an opportunity as new care delivery and payment models emerged (such as ACOs). There were concerns expressed about the limited understanding of the importance of partnering and including LTSS and HCBS services in new payment models. Inclusion of LTSS and HCBS is beginning to emerge in some ACOs as a strategy to manage costs and improve outcomes. Senders and receivers of information are often challenged to get the right information and the right amount of detail to support their clinical purpose. Either too much information is sent creating an overload for the receiving provider ("sleuthing") or too little information is sent -- it is often all-or-nothing. Redundant data is also common. Staff would like to see a portal that would allow a receiver to control the amount and type of information they can access to support the transition and shared care processes. This would be addressed with an HIE if it includes the information needed by receiving providers. Depending on its structure and governance, this request could be accommodated via the forthcoming Chicago-area HIE. HIE tools such as Allscripts Care Management currently do not have standardized reports that for tracking and trending of data based on clinical content, risk assessment tools or other reporting requirements between Rush and their community partners. Rush Case Management Department is talking to Epic about developing standard reports for their referral sources. Currently the capability is not available. Early screening and identification of patients who may require LTSS is crucial. The lack of consistent screening across all relevant admissions can be problematic. Hospitals could address this by implementing a screening tool of the psychosocial elements and risk factors to determine early during a hospital stay which patients may need services. Establishing a care plan prior to discharge is crucial to ensuring appropriate services are set up and consistent with the discharge and teaching plans. This is very challenging when the referral is made after discharge. Similarly, implementation of such screening tools and shared care planning mechanism prior to a hospital stay; for example, in emerging service delivery reform models (e.g., ACOs) might also improve care and decrease costs. Community care coordinators/social workers often establish a community care plan, but it is not integrated with a larger plan for the patient. A patient may have many care plans established by various providers that are not coordinated or reconciled with each other. A sustainable vision for aging and disability services is needed that includes improved integration. Rush has developed a number of programs and processes to improve care transitions and coordinate with community providers. Their LTSS programs are integrated into interdisciplinary teams and community providers are engaged in the discharge planning process. Almost all of the participants in the transition process report an opportunity for improved communication and efficiency through technology. Some tools such as AllscriptsCare Management have been helpful in facilitating information exchange, but they are not consistently applied across all community providers and services. Coordination and deployment of services is at the heart of the LTSS programs at Rush. Staff spend a significant time with communication tasks (making calls, followup, sending faxes, verifying receipt) to share information with service providers. Technology and improved tools could be beneficial in supporting the work of LTSS providers. The PERFECT Form is a communication and accountability tool developed to encourage collaboration after hospital discharge between home health partners and the clinical team at RUSH. The information provided by the admitting RN in the field provides a critical snapshot of the patient in their home environment and helps us define care expectations for a successful transition from hospital to home. Hand off communication is essential to assure quality coordination of care. ___ No Plan of care discussed with pt. & family/ consent for care signed? Teaching initiated for at risk Dx. ___ No Health literacy issues identified at SOC? ___ No Barriers to scheduling visits present? ___ No Provided within expected timeframe? ___ No Additional DME needs? ___ No Pt has dc instructions? ___ No D/C list match meds found in home? ___ No Pt. able to obtain meds w/out barriers? Who fills the pillbox? ___ No Pillbox in home? ___ No Are medications adequately managed? ___ No MD appt scheduled within 10 days? ___ No Can pt physically get to the appt? ___ No Is transportation available for f-up appt.? ___ No Is primary caregiver available?